With spring just around the corner, freshwater anglers across Texas are cooking up plans to visit their favorite lake, river or stream to enjoy the warming weather and hopefully catch a few fish. Some will have pot-bellied largemouths on their minds, but others will be geared for crappie, catfish or the droves of white bass that are finning their way upstream from major impoundments to engage in the annual spawning run. One thing anglers of all kinds need to keep in mind when plotting a strategy this spring is low water levels. Unless big changes have occurred since Christmas, many lakes will still be short on water thanks to a lingering drought that refuses to let go in many parts of the state. Some lakes are a heck of a lot worse off than others, as reflected by vast fields of stumps and parched soil cluttered with rocks, logs, bushes and other junk that will eventually go into hiding once the rains come and water levels rise. Although a lake that is several feet below normal may not be all that pretty to look at, it holds a special appeal to a lot of guys like me. That is because low water can provide us with some distinctive advantages that high water takes away. Perhaps the most obvious advantage of low water is it shrinks the size of the playing field, thus leaving hundreds or even thousands of acres of basin void of water. This naturally provides the fish with less room to roam around and makes them easier to find provided you have a clue of what to look for. As water levels fall, it forces fish off of flats and concentrates along the edges of creek channels, river channels, points and other structure that provides quick, easy access to deep water security. This narrows the size of the playing field even more. Better yet, it offers a pretty good hint as to where anglers should begin searching for fish, and which tactics might work best for catching them. Low water has its disadvantages too, particularly when the downward fluctuation is extreme. Not only does low water relocate shorelines, it also creates shallows in places where previously none existed and exposes humps and islands that can pose navigational hazards for boaters. Furthermore, shrinking water levels allow underwater stumps and other obstructions to creep close enough to the surface, that some boat lanes may no longer be safe to run. 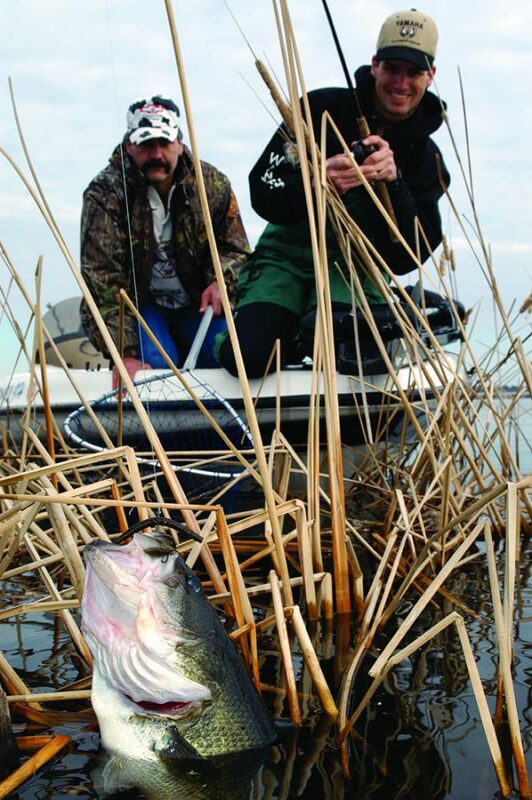 Bass always begin gravitating towards shallow water to spawn during late and early spring, usually by way of underwater avenues such as creeks, ditches and drainages that connect deep water to shallow. When the timing is right, they will disperse onto adjacent flats and points to do their thing. Low water takes a lot of the backwater spawning areas out of the picture. Likewise, Bassmaster Elite Series pro Todd Faircloth of Jasper advises concentrating more on flats, points, humps and main lake ridges situated in close proximity to the main water body. Faircloth added that flats and underwater points situated in close proximity to a creek channel can be like magic this time of year. To refine the search he suggests targeting stumps, grass or other types of cover/structure the fish will be apt to congregate around. Crappies operate in a way similar to bass in that they rely on creek channels as highways to lead them to skinny water spawning areas. When water levels are normal or high, Toledo Bend fishing guide Stephen Johnston says he will look for groups of pre-spawn crappie to be suspended on creek-side flats until nearby spawning areas warm sufficiently. Low water changes things because it alters the areas the fish will stage and ultimately spawn. 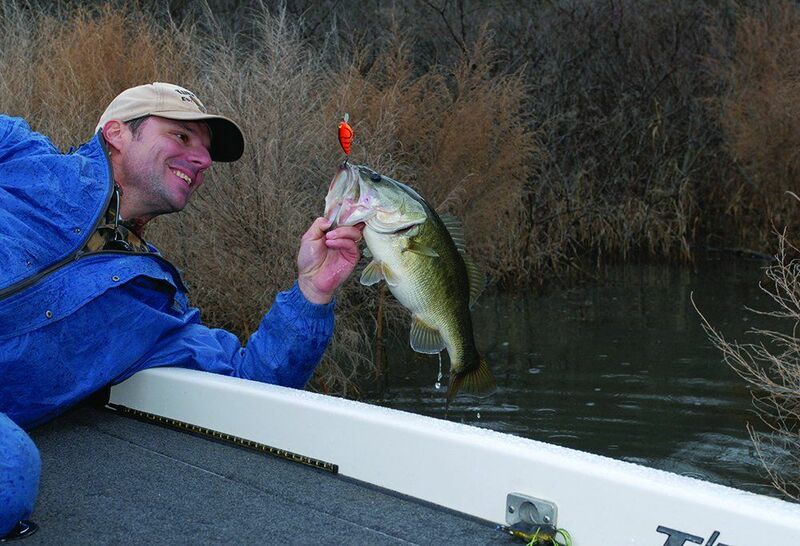 Cedar Creek fishing guide Jason Barber has been dealing with low water for several years now at his home lake. He advises looking for pre-spawn crappies around brush piles situated along channels and points leading into pockets and marinas that have a history of attracting spawning crappies. He says the fish also like to suspend around bridge rock, because the rocks absorb and release heat that will cause water temperatures to be a degree or two warmer than surrounding areas. Whiskered fish usually don’t start thinking about spawning until late spring. Contrary to popular belief, deep water is not always the best place to be when the water is low and cold. Barber says he catches big numbers of blues and channels in water shallow enough to wade at this time of year. Shallow stump fields are always good places to look, especially in areas bisected by a definitive channel or ditch. Areas where cormorants roost also can be productive, because catfish will gather beneath them to dine on their droppings. Drifting over deep water along channel breaks, humps and random open water areas in 20-30 feet of water also can be productive, especially for trophy-size fish upward of 40 pounds. Good electronics and working knowledge of how to use them can be a huge plus in open water arenas, because they will enable you locate the roving pods of shad that whopper-size cats like to feed on.